Several environmental health studies suggest birth weight is associated with outdoor air pollution during gestation. In these studies, exposure assignments are usually based on measurements collected at air quality monitoring stations that do not coincide with health data locations. So, estimated exposures can be misleading if they do not take into account the uncertainty of exposure estimates. In this article we conducted a semi-ecological study to analyze associations between air quality during gestation and birth weight. Air quality during gestation was measured using a biomonitor, as an alternative to traditional air quality monitoring stations data, in order to increase spatial resolution of exposure measurements. To our knowledge this is the first time that the association between air quality and birth weight is studied using biomonitors. To address exposure uncertainty at health locations, we applied geostatistical simulation on biomonitoring data that provided multiple equally probable realizations of biomonitoring data, with reproduction of observed histogram and spatial covariance while matching for conditioning data. Each simulation represented a measure of exposure at each location. The set of simulations provided a measure of exposure uncertainty at each location. 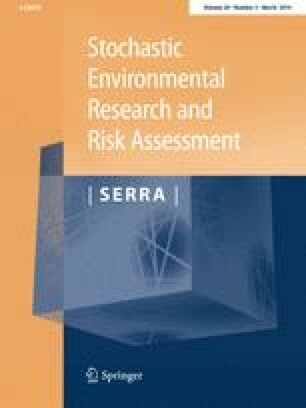 To incorporate uncertainty in our analysis we used generalized linear models, fitted simulation outputs and health data on birth weights and assessed statistical significance of exposure parameter using non-parametric bootstrap techniques. We found a positive association between air quality and birth weight. However, this association was not statistically significant. We also found a modest but significant association between air quality and birth weight among babies exposed to gestational tobacco smoke. The work was done under the research project GISA, funded by private companies: GALP, Repsol, APS, AdSA, AICEP, CARBOGAL, EDP, EuroResinas, KIMAXTRA, REN and GENERG; and managed by local authorities: CCDRA, ARSA and Municipalities of Sines, Santiago do Cacém, Grândola, Álcacer do Sal and Odemira. The authors also acknowledge all mothers participating in the project for their contributions and FCT-MEC for financial support (SFRH/BD/86599/2012, SFRH/BPD/75425/2010, PTDC/AAC-CLI/104913/2008). The authors declare no competing financial interests.